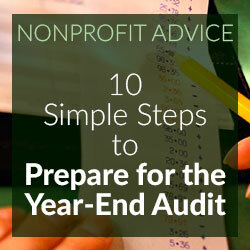 Year-end is a stressful time for nonprofit finance staff. 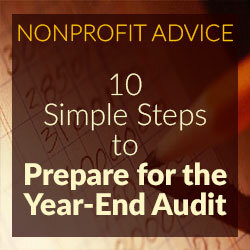 In addition to completing the normal day-to-day tasks, finance staff is also inundated with closing the fiscal year books and preparing for the year-end audit – a process that can take anywhere between one to three months depending on the nonprofit and the timing of the audit. Although the process needn’t be too strenuous if the finance department properly processes monthly closes – whereby all transactions are posted, allocations properly completed, support schedules updated, and accounts thoroughly reviewed – there is inevitably much to do between the final month of the fiscal year and the start of the annual audit. Review all lease agreements and leasehold improvements. Make sure all leases are readily available for the auditors, especially any new leases signed during the year. Keep in mind that any tenant improvement allowances provided by the landlord must be recorded in the accounting system and amortized over the life of the lease. Since tenant improvements are typically incentives provided by and paid for by the landlord and result in no cash outlay for the recipient organization, many organizations fail to record these transactions. Review all contracts, pledges, and grant agreements, and have them scanned and available for the auditors on the first day. The auditors will review these agreements to make sure revenues and expenses were properly recorded and conform to the revenue recognition rules (including donor restrictions). Set a clear deadline on collecting prior-year expenses from employees, contractors, and vendors, and send multiple reminders as the deadline approaches. Nothing is more frustrating than closing the books for the year only to receive an unexpected prior-year expense report from an employee after the fact. And, after all expenses are posted, make sure you thoroughly review variations between current year and prior year-end totals for each account. Auditors typically ask the finance staff why certain expenses have significantly increased or decreased compared to the prior-year. Conduct a physical inventory check and update any fixed asset or equipment lists. Make sure all inventory is properly tagged and that any equipment currently carried on the books hasn’t “disappeared” over the course of the year. A good auditor will ask to see your inventory list and then request to see the physical pieces of equipment. Review accounts payable and accounts receivable aging reports as well as bank reconciliations. Make sure all AP/AR is current (or at least not more than 30 days past due) and confirm that all outstanding checks on your bank reconciliations are also current. Keep your books clean by contacting individuals who have yet to cash your checks, and, if necessary, void old checks and have them reissued if any recipient claims his/her check was lost. Review all support schedules for completeness and adherence to organizational policies. Although it’s easy to review the schedules to make sure they are balanced and complete, be sure to compare the results to the organization’s policies (i.e., if staff advances must be cleared within 30 days, make sure the staff advance support schedule shows no employee with an outstanding advance that runs counter to that policy). Gather all Board documents including bylaw changes, resolutions, and minutes, and put together a list of all Board members — being sure to highlight any Board offices held. Auditors inevitably ask for this information. And make sure any outstanding items included in the Board minutes are followed-up on and any bylaw changes or resolutions were fully enacted. Review all personnel files to make sure they are complete. Be sure the files contain documentation for any salary increases, tax and employment forms (such as I-9s), and updated job descriptions. Make sure there is an updated organizational chart as well and a current list of employees available for the auditors. Review the accounting files to make sure proper support documentation exists and that all calculations are correct. This includes double-checking that documents were processed correctly (in accordance with the organization’s policies) and that proper approvals were obtained. Be sure to also focus on any manual journal entries and any transactions that require management’s estimate – such as an allowance for doubtful accounts and valuing in-kind donations. You will also want to double-check any year-end accrual calculations and payroll reconciliations. And, as a nonprofit organization, keep an eye out for any transaction that runs counter to the organization’s charity mission as it may be subject to unrelated business income tax. Lastly, review the organization’s internal control structure. Throughout the year, due to staff turnover, it’s possible that the internal control process may have been compromised. Although it’s important to do this regularly, especially after major hiring or downsizing phases, year-end is also an appropriate time to review the overall internal control structure. Most auditors will require organizations to complete risk assessments as part of the audit process – a task that helps the auditor pinpoint areas of weakness in the internal control process. Given the vital role the finance department plays in nonprofit organizations, it’s important to make sure the department is functioning properly and operating at its best. Preparing for the year-end audit, although a stressful time for most, is actually the perfect opportunity for the department to focus on what it’s doing right and where improvements are needed. With the right planning and a solid year-end check-list focused on reviewing the accounting books, organizational records, financial processes, and control structure, finance departments can be assured a successful annual audit.